Baking is therapeutic, a big Yes from my side. I love baking and trying out new flavors and combinations. Some combinations do amaze me and tickle my taste buds while some just surpass as being ordinary ones. Recently while looking for some unique cake recipes on Pinterest I stumbled upon this recipe. And the name itself intrigued me to find out the details. 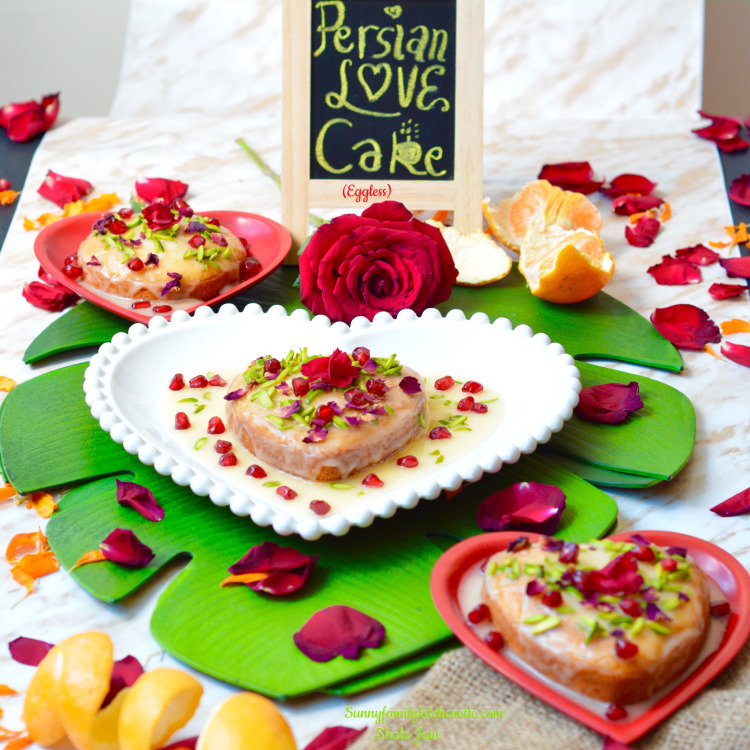 A Persian Love Cake is a beautiful thing.The story behind this Love Cake is as beautiful as this cake is. There is a story behind the name that once upon a time there was a Persian woman madly in love with a prince. 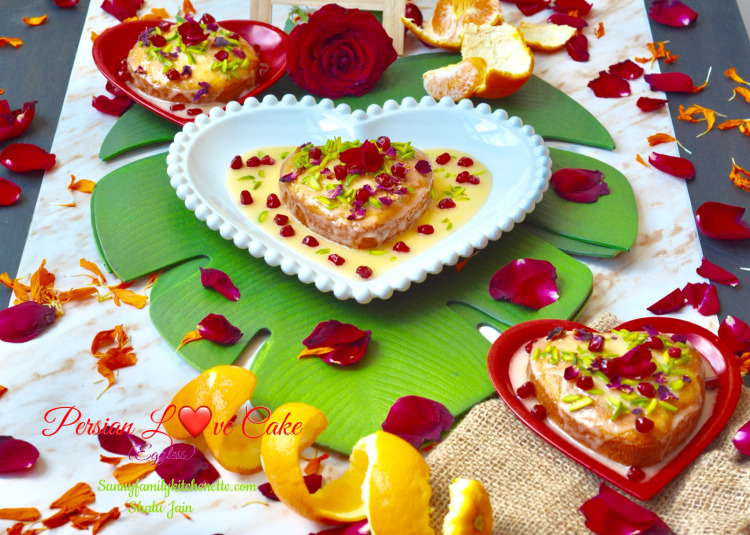 To make him fall in love with her, she baked him this cake, filled with magical love powers. There are many different versions of the cake. Some use of basic sponge recipe which is followed by drenching the cake in citrusy rose water syrup, and some recipes call for addition of nuts to the base cake. Frosting can be of flavored cream, or a simple glaze and there are different combinations of nuts and spices. 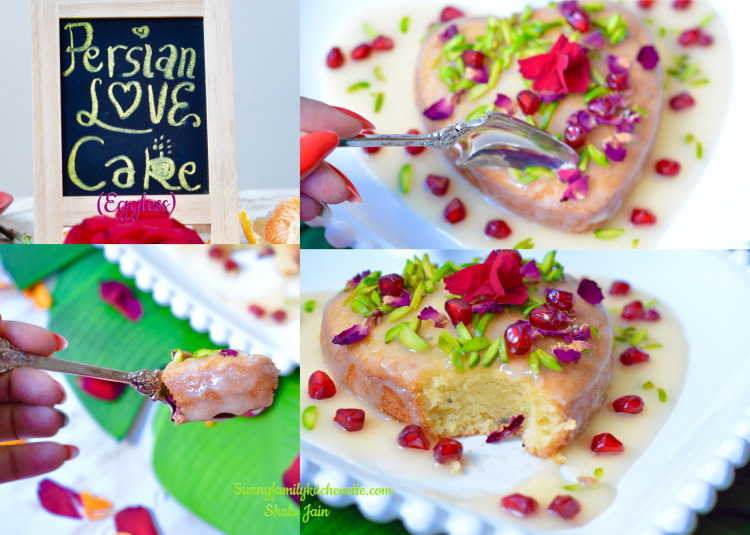 However I have used my basic cake recipe while adding in the Persian Flavors. The cake is good enough on its own – rich, moist and decadent. Since I have kept the layers as thin ones so there was no need to do any drizzling of syrup and then frosting.And instead of doing any cream frosting I have done a simple glaze of sugar and orange juice, which actually went very well with the cake. 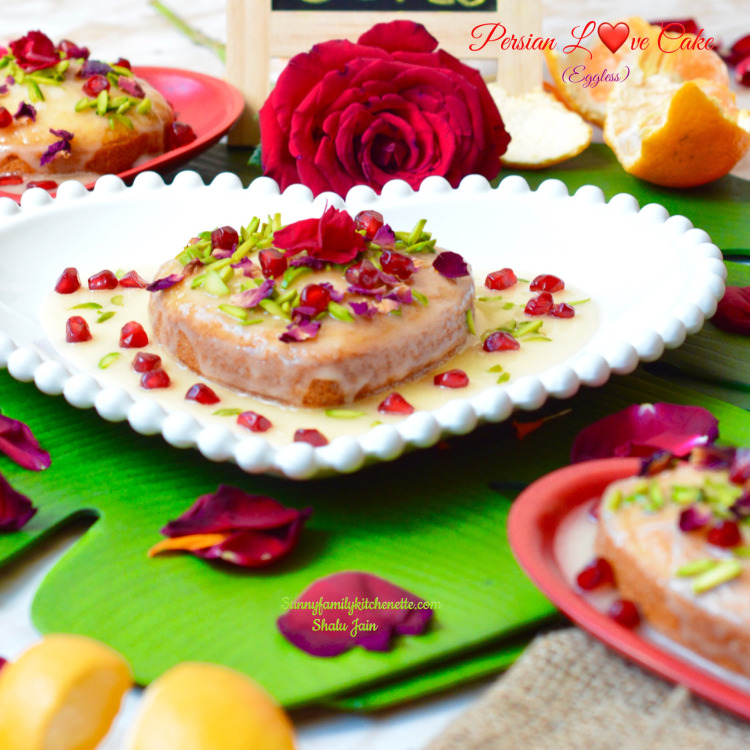 With enchanting ingredients like cardamom, rose water, rose petals, saffron and fresh orange juice, how can anyone resist this sweet temptation? The citrussy flavor of the cake when meets the Queen of spices, Cardamom, is pure bliss. In addition to that rose water and saffron gives this heavenly cake a divine taste. How can one not fall in love with such a lovely beauty!!! And nothing can be more apt than this to make for The festival of love, Valentines. 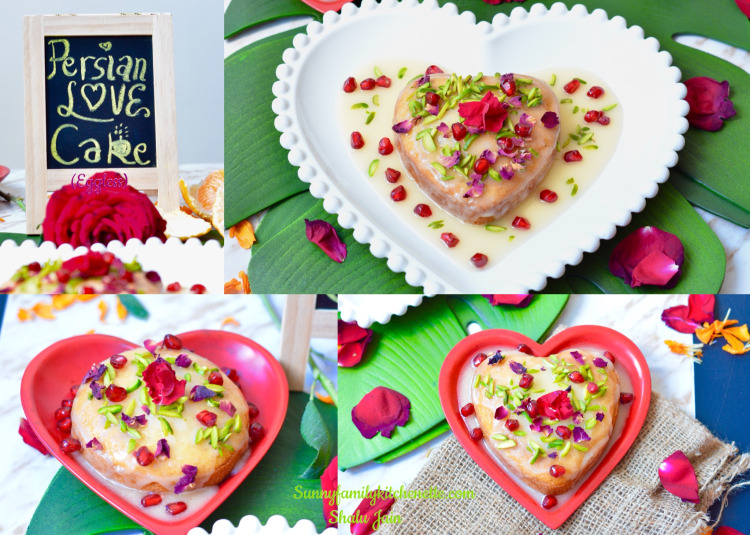 February is the month of love and this recipe just shouts love. Not only the name but the bursting flavors are just so adorable and addictive. While clicking pics of the cut piece I popped that in my mouth and you have to believe me that I just kept my camera on side and grabbed the plate and finished the cake in one go. No wonder it's called Love Cake. 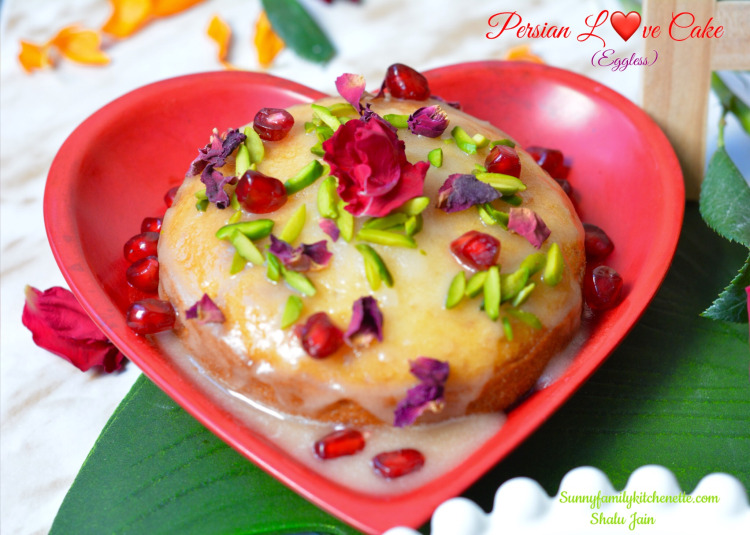 Love at first bite ;) Persian love cake is love in every bite. 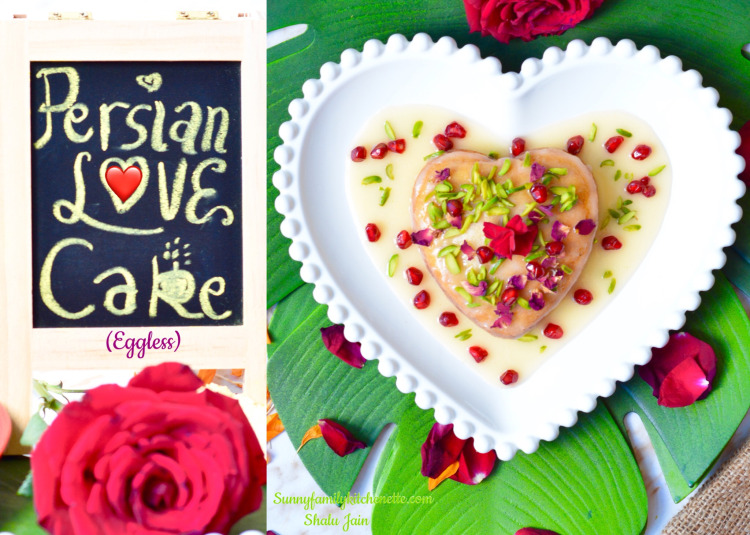 Here’s the recipe for this gorgeous Persian love cake. For Garnishing the Cake: Pista slivers, Dried Rose Petals and some Pomegranate Arils. 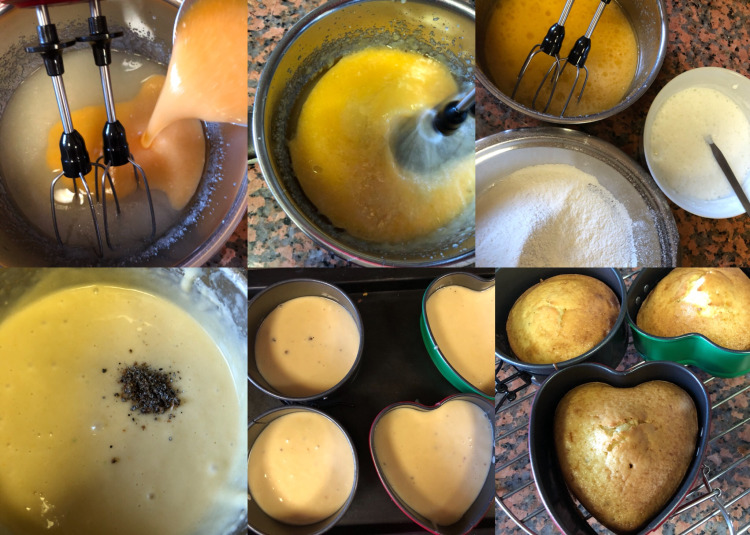 I wanted to make Mini Cakes hence I have used four cake pans of 4" each. With the above mentioned ingredients I got four cakes of 4" in diameter and approximately 1" in height. Prepare the cake pans by greasing them with oil or butter and dusting them with flour or else you can generously spray non-stick spray too. I prefer spraying them with non stick spray. Meanwhile Mix and sift twice All purpopse flour,baking powder and salt. Mix well Sugar and Oil. Add in orange juice, rose water and saffron milk mix. 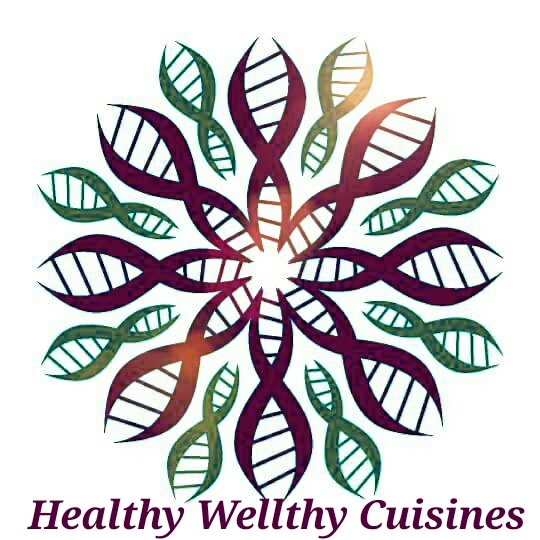 Whisk the yogurt with water and add vinegar. Add in baking soda. The mix will start frothing. Now mix everything together- yogurt mix, oil mix, crushed cardamom seeds and sieved flour mix. They should be 1/2 to 2/3 full. Tap the pans 2-3 times for the batter to settle down evenly and to remove any air bubbles. Place the pans in the preheated oven and bake for 20-25 minutes at 180*C.
After that check by doing Toothpick test. Insert a toothpick in the cake, if it comes out clean they are done, if you see some batter is still sticking to the toothpick place them again in the oven. Mix them both with the help of a hand mixer till they are well combined. Pour glaze all over the top of the cooled cake and allow the excess glaze to drip down the sides of the cake. 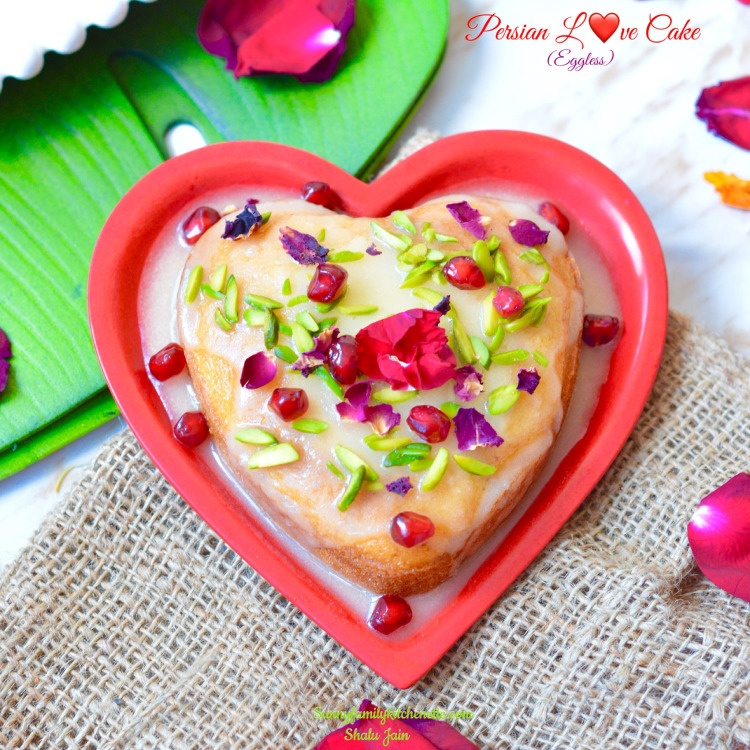 Sprinkle chopped Pistachios, Rose petals and Pomegranate arils all over the top of the cake to garnish. Serve with Love and have a super Lovely time with your loved ones!!! 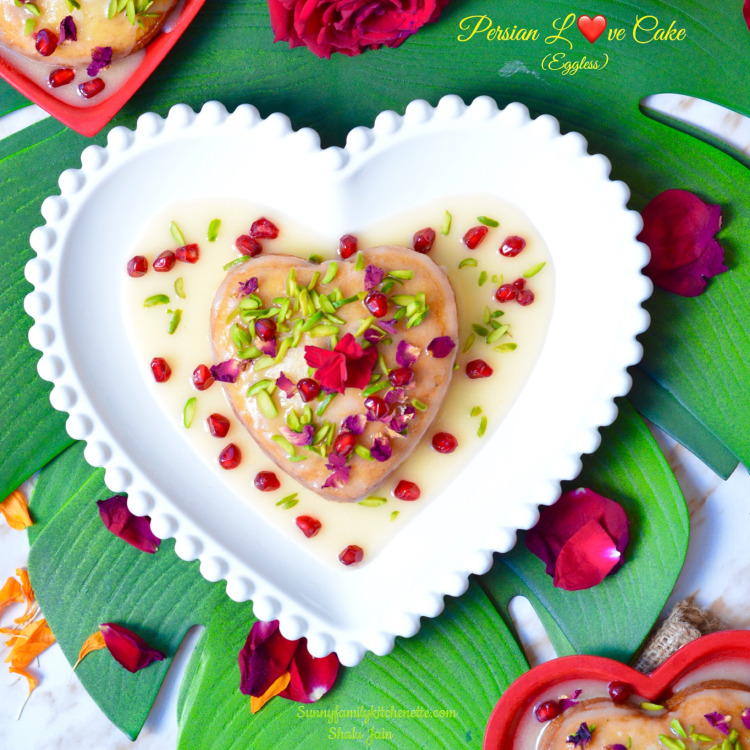 This recipe of mine is going to my Facebook Bloghop Group Healthy Wellthy Cuisines where the theme this time is Valentine's day/ pyaar ka Tyohar.